I rotate through shoes each day. So far, they’ve lasted a long time. Walk, walk, walk. Here’s the fact I like most about the past 12 months of walking 50 to 70 miles a week while working: One hospitalization. Yep. In years past, that number would be two or three hospital stays in a 12-month period. And the only reason for the last visit in November was because I caught the virus from hell. Luck? Perhaps. But isn’t luck something we make ourselves? There’s no doubt my conditioning is much better. I don’t get tired when we’re out and I walk a long distance. I can stand while others with normal health sit. I can stand all day now. So, in the last 12+ months, I estimate I’ve walked across the country – 2,500 miles or more. I average 10 to 14 miles a day, and 50 to 60 a week. Sometimes more than 70. My record for one day is 18 miles. Total steps in the last year: I’m in the millions. I wish that total was in dollars. I do my treatments while I walk. I eat M&Ms Minis while I walk. I eat and spill yogurt while I walk. I’m writing this post while I’m walking. And so far I’ve done all of these without wiping out, though I’ve had close calls. The one downside created by the miles is planter fasciitis. The reality: my feet hurt. It’s hard to walk barefooted now. But it’s been worth the benefits to my lungs and the endurance I’ve gained in my legs. I’ve lost about 10 pounds, a lot of it around my gut. And I’ve done it without eating less. I’m grateful I read the New Yorker article a year ago and learned about walking on a treadmill while working. It had never occurred to me that there was an alternative to sitting all day at a computer. Lucky me, I say. Lucky me. This entry was posted in cystic fibrosis, treadmill desk and tagged cystic fibrosis, Treadmill desk by unknowncystic. Bookmark the permalink. Very happy you are doing so well! I have issues with flat feet and I went to Sport Chalet and bought “super feet” to put in my shoes. It fixed the problem! This is so freakin’ awesome! It’s a huge accomplishment. I’ve got to figure out how to incorporate a treadmill into my workspace. Way to go Unknown! You inspired me to set up my own treadmill desk and I LOVE it. Oddly, I also have plantar fasciitis right now, but from running in stupid shoes, not from walking. I second the suggestion about rolling on the ball (I use a lacrosse ball). It hurts, but it really does help! Very cool. Glad you like it. I use a tennis ball and I bought a rocker device from Amazon that works really well. It’s a great stretch for the heel and calves. you are totally on it as normal squire 🙂 respect due and all that! What you’re doing is really impressive and inspiring! And I’m so happy to hear you’re feeling better. Thanks for checking in. Good to know you’re still out there in cyberspace. Thank you for sharing this news about the treadmill. Excellent. It’s especially important for women to get the blood flowing. Sitting harms them more. Trying to convince my wife to do it. Strange I convinced my friend all the way in Australia, but not her. Regarding a lean stomach, well, sometimes. It depends on my M&M’s intake for the week. Oh, I feel for what your family has to go through, especially your son. I’m sending good wishes to the Universe to step in and help him. I’m happy you’re out there reading. 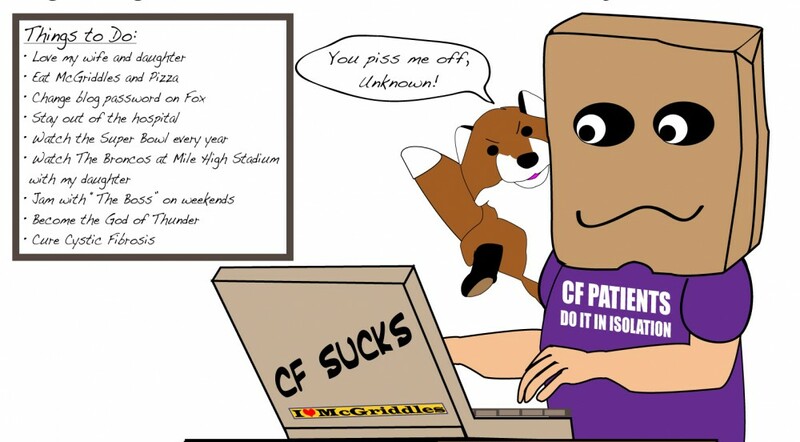 If they do cure cf, I’m bringing the family to Australia and England to meet my blog friends. And Texas too. And AZ and GA. I’ll have a lot of places to visit. Keep walking. It gets easier. I wish all of you happiness and no hospital visits.